Manufacturing output in the Eurozone grew at the weakest pace in nearly four years in October. New analysis from Nordea Markets suggests it could soon start to decline based on leading indicators that have been reliable in the past. “This doesn’t bode too well for the momentum in growth heading into early 2019,” it says. All is not well in the Eurozone’s manufacturing sector with output levels growing at the slowest pace since late 2014 in October, according to IHS Markit’s flash manufacturing PMI. For the world’s largest economic bloc, surpassing the size of the United States and Chinese economies, it was an unsettling reading at a time of heightened trade tensions and turmoil in financial markets. Those concerns could be about to get a whole lot worse if the chart below is anything to go by. Posted on Twitter by Andreas Steno Larsen, Senior Global FX and Fixed Income Strategist at Nordea Markets, it overlays the Eurozone manufacturing PMI against new orders less inventories from Sweden’s manufacturing PMI report. The latter has been advanced by five months to demonstrate the relationship between the two. 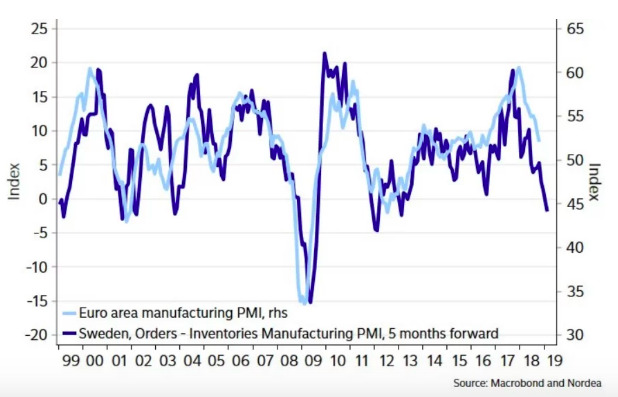 While not a perfect relationship, the latter more often than not tends to lead movements in the Eurozone manufacturing PMI with the current level suggesting that overall output could actually start to decline in the months ahead. “[This has been the] sad trend in the Euro area since early 2018,” he posted on Twitter. “We are reluctant to call an end to this tendency, as leading versus lagging parts of the Euro-area PMI suggests further downside, as does the ‘Swedish canary’. Chris Williamson, Chief Business Economist at IHS Markit, expressed similar concerns following the release of the flash Eurozone manufacturing last week. “The pace of Eurozone economic growth slipped markedly lower in October with the PMI setting the scene for a disappointing end to the year,” he said. You can follow Andreas Steno Larsen on Twitter here. For those who like charts, he’s an excellent follow.